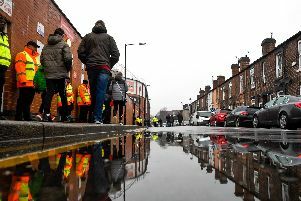 Detectives investigating eight fatal stabbings in Sheffield so far this year have charged suspects in six of the cases, with two still unsolved. Eight victims aged between 15 and 85 have died in knife attacks in the city this year, with the latest losing his life at the weekend. Gavin Singleton, aged 31, was stabbed in an attack in Walkley Lane, Hillsborough, on Sunday, September 23 and spent nearly two weeks in a critical condition before losing his fight for life on Saturday, October 6. Daniel Trotter, aged 24, of no fixed abode, was charged with attempted murder, wounding, supply of controlled drugs and possession of an offensive weapon in the immediate aftermath of the incident. The first fatal stabbing of the year came on Thursday, March 8 when Jarvin Blake, aged 22, was attacked at the junction of Catherine Street and Brackley Street, Burngreave. Josiah Foster, 26, of the Manor, Sheffield; Lewis Barker, 26, of Parson Cross, Sheffield; Devon Walker, 24, of Burngreave, Sheffield and Caine Gray, 27, of Treeton, Rotherham, have been charged with murder. The following month detectives launched two murder investigations in two days. Ryan Jowle, 19, was knifed in his chest in Tannery Close Woodhouse, on Wednesday, May 23. The next day, Samuel Baker, aged 15, was fatally stabbed in Lowedges Road, Lowedges. A 15-year-old boy, who cannot be named for legal reasons, has appeared in court and pleaded guilty to manslaughter. Michael Andrew Goddard, 50, of Steven Close,Chapeltown, has been charged with his murder. Kavan Brissett, 21, was knifed in his chest in an alleyway off Langsett Walk, near Upperthorpe, on Tuesday, August 14 and died in hospital four days later when his life support machine was switched off. Nobody has yet been charged over the killing. An 18-year-old man was arrested on suspicion of attempted murder and three boys - two aged 17 and one aged 16 - were arrested on suspicion of conspiracy to rob and have all been bailed pending further enquiries. Detectives investigating the murder are trying to trace 29-year-old Ahmed Farrah, who is also known as Reggie and who is believed to hold vital information about the stabbing. Farrah, who has links to Broomhall, is said to know he is wanted but is actively evading arrest. A warning has been issued that anyone found to be helping him faces prosecution. Alan Grayson, 85, was stabbed during an incident at his home in Orgreave Lane, Handsworth, on Thursday, September 13. His wife, Marjorie Grayson, 83, has been charged with murder. Fahim Hersi, 22, from Broomhall, died after he was stabbed during a fight outside the cinema at Valley Centertainment on Friday, September 21. He was rushed to hospital with a stab wound to his chest but could not be saved. Nine arrests have been made so far, with eight suspects held on suspicion of murder. Five were released under investigation and three were released with no further action to be taken. A 21-year-man was arrested on suspicion of assault over the non-fatal stabbing and later released.